"For the past year I co-oped with General Motors at the Corvette Assembly Plant in Bowling Green, Kentucky. I had the coolest co-op in the country because of the great projects I was able to work on in the paint shop. I worked almost exclusively on the launch of the 2014 Corvette C7. I was sworn to absolute secrecy and product security was always a top priority. There were certain areas of the plant where I was escorted through a key card access door to sign it with the security officer before working on my assignments. The car was unveiled on January 13th and there are still many aspects of my work that I cannot discuss publicly or privately. I am returning to General Motors this summer and will continue to work on the new car in the General Assembly area. I have absolutely loved my experience with GM and wouldn’t trade it for anything in the world. I will never work on this high profile of a project for the rest of my career." 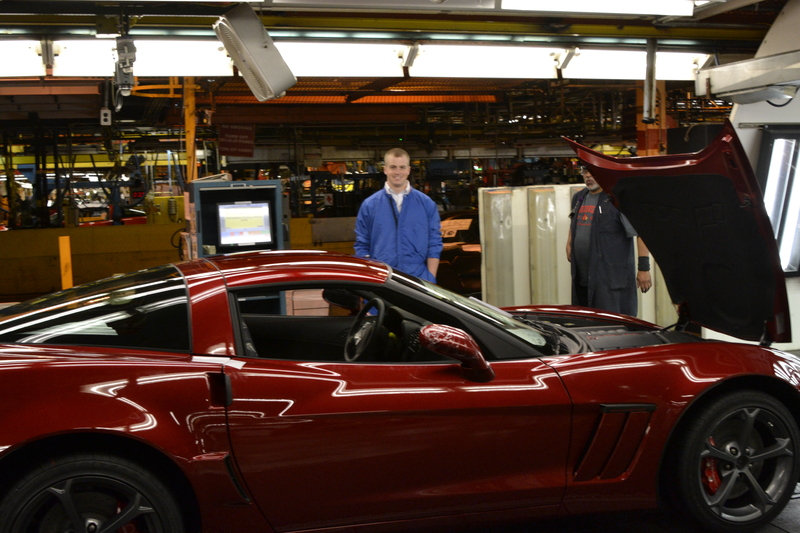 Kyle showing the fruits of his labor...the 2013 Corvette Grand Sport fresh off of the assembly line. "I've got a theory that if you give 100 percent all of the time, somehow things will work out in the end."